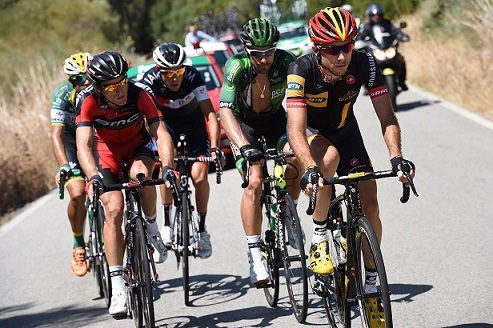 Team MTN-Qhubeka had Sergio Pardilla come in 18th position at the Vuelta a Espana after the third stage on a scorching hot day in Spain. Michael Matthews (Orica Greenedge) would reign supreme on the tough final 2km climb to the line. He out sprinted Dan Martin (Garmin Sharp) and Joaquim Rodriguez (Katusha) for the victory. Jacques Janse van Rensburg was again the star of the show, getting into the break on consecutive days. He was joined by four other riders in Lluis Mas (Caja Rural), Danilo Wyss (BMC), Jerome Cousin (Europcar) and Jonathan Fumeaux (IAM Cycling). The gap dropped suddenly to 3’30” after a rapid chase led by the Aussie team. Mas took off on his own and pushed his lead out by a further minute over the final 40km’s as Janse van Rensburg and his remaining escapees rolled through until swallowed by the bunch. Mas would not last out in the heat on his own and would be reeled in with 20 odd kilometers to go. “Yeah it was another good day with me getting into the break. I wasn’t able to win anything as the other riders were just too fast in the sprint for me but we got some good exposure for the team and for MTN I think. “It was really hot out there but I was coping well with it at least. I’ll definately take it easy the next few days now and then see how I can support Sergio on stage six,” said Janse van Rensburg.